Sandie Maciver of Sandie Photos Representatives from the crofting townships who have made a windfarm application. 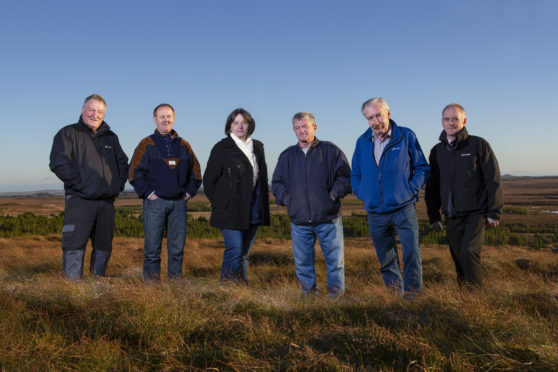 From left to right: Angus Campbell from Melbost and Branahuie, Donnie MacDonald from Aignish, Rhoda Mackenzie from Sandwick North Street and Murdo Macleod, Calum Buchanan and Kenny Morrison, all from Sandwick East Street and Lower Sandwick. The planning application submitted to Western Isles Council by a crofters consortium known as Sandwick North Street is for the erection and 25-year operation of a single wind turbine up to five metres, and associated infrastructure. Sandwick North Street’s project is one of the four community schemes that are in conflict with an application for 36 turbines from French-owned Lewis Wind Power’s development of the same site. If it goes ahead, the single turbine, would be close to the three Beinn Ghrideag turbines owned by Point and Sandwick Trust, as it is already on the North Street grazings on Pentland Road. Lewis Wind Power , a multinational company EDF Energy and Wood Group, with a lease from landowner Stornoway Trust, is seeking to develop a 36-turbine wind farm. The rights to develop the land is currently the subject of legal proceedings in the Scottish Land Court. The court held its first hearing in the case in Stornoway in December. Planning applications from the other three crofting townships – Melbost and Branahuie, Aignish and Sandwick East, and Lower Sandwick – are expected to be lodged over the next few months. Together the four townships are seeking to develop a total of 21 turbines. Rhoda Mackenzie, spokeswoman for Sandwick North Street, said it was a relief to be at the stage of formally applying for planning permission. Mrs Mackenzie said: “It’s been a long road to get to this stage and we’re glad we’ve reached this stage now. “All the necessary legal requirements are slowly coming together but we’re confident that they’ll all be in place. We are continuing to work through all the processes and legal requirements. The community wind farms’ policy of financial distribution – should they go ahead – would be for 70 per cent of the profit to go across the wider islands region, so the whole of the Western Isles stands to gain significantly from the development. Mr Mackenzie said the crofters’ proposals could be developed alongside the plans from Lewis Wind Power.